USS Vesuvius, the third ship of the United States Navy named for the Italian volcano, was a unique vessel in the Navy inventory which marked a departure from more conventional forms of main battery armament. She is considered a dynamite gun cruiser. Vesuvius was laid down in September 1887 at Philadelphia, Pennsylvania, by William Cramp and Sons Ships and Engine Building Company, subcontracted from the Pneumatic Dynamite Gun Company of New York City. She was launched on 28 April 1888 sponsored by Miss Eleanor Breckinridge and commissioned on 2 June 1890 at the Philadelphia Navy Yard with Lieutenant Seaton Schroeder in command. Vesuvius carried three 15-inch (38-cm) cast iron pneumatic guns, mounted forward side-by-side at a fixed elevation of 16 degrees. Gun barrels were 55 feet (17 meters) long with the muzzles 15 feet (4.6 meters) above the deck 37 feet (11 meters) abaft the bow. In order to train these weapons, the ship had to be aimed, like a gun, at its target. Compressed air from a 1000 psi (70 atm) reservoir projected the shells from the "dynamite guns." Two air compressors were available to recharge the reservoir. The shells fired from the guns were steel or brass casings 7 feet (2 meters) long with the explosive contained in the conical forward part of the casing and spiral vanes on the after part to rotate the projectile. The explosive used in the shells themselves was actually a "desensitized blasting gelatin" composed of nitrocellulose and nitroglycerine. It was less sensitive to shock than regular dynamite but still sensitive enough that compressed air, rather than powder, had to be utilized as the propellant. Shells containing 550 pounds (250 kg) of explosive had a maximum range of 1 mile (1.6 km), but range could be extended to 4000 yards (3.7 km) by reducing projectile weight to 200 pounds (100 kg). Maximum muzzle velocity was 800 feet (250 meters) per second. Range could be reduced by releasing less compressed air from the reservoir. Ten shells per gun were carried on board, and 15 shells were fired in 16 minutes 50 seconds during an 1889 test. The shells employed an electrical fuze which could be set to either explode on contact or delayed to explode underwater. In 1898 due to tensions with Spain, the American Fleet gathered in Florida waters, and Vesuvius hurried south from Newport, Rhode Island, and arrived at Key West, Florida, on 13 May. She remained there until 28 May, when she headed for blockade duty in Cuban coastal waters. 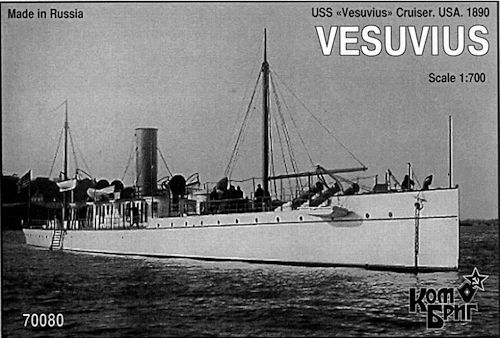 Vesuvius performed special duties at the discretion of the Fleet Commander in Chief and served as a dispatch vessel between Cuba and Florida into July 1898. On 13 June, Vesuvius conducted the first of eight shore bombardment missions against Santiago, Cuba. The cruiser stealthily closed the shore under cover of darkness, loosed a few rounds of her 15-inch dynamite charges, and then retired to sea. Psychologically, Vesuvius's bombardment caused great anxiety among the Spanish forces ashore, for her devastating shells came in without warning, unaccompanied by the roar of gunfire usually associated with a bombardment. Admiral Sampson wrote accordingly, that Vesuvius bombardments had "great effect." Although the dynamite guns were relatively quiet, detonation of their large high explosive shells sounded different than contemporary gunpowder-filled artillery shells; and soldiers observed the explosions "made holes like the cellar of a country house." She was later converted to a torpedo testing ship in 1905 and in 1915 was hit by an errant torpedo which circled around and slammed into her hull. She was beached before she sank. She was decommissioned and sold for scrap in 1922. I ordered this one from a shop in Russia as I'd heard about these kits but had not seen one. The kit arrived in perfect condition, thanks to the superb packaging by the shop. When I opened the box, all I saw was a sea of foam peanuts. Under them was a small bag with an equally small kit inside. The hull on this one measures under 4.5 inches and the resin bits are equally Lilliputian. It gives me a greater respect for those who successfully build these sorts of kits. The molding itself is very well done. While the underside of the ship's hull had plenty of air bubbles, there were none on any of the other parts save one on a lifeboat. The parts include the main armament, an upper deck, funnel, air intakes, masts and smaller pieces that I think are gun barrels for the light guns along the ship. 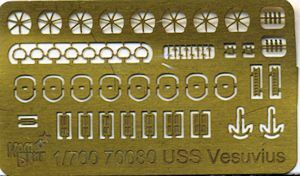 There is a photo etch fret that includes the gun mounts for the eight smaller weapons along the outer edges of the upper deck. I have to say that building these will require some sort of magnifying lenses. The gun shields are also included in this as are the ship's anchors and the hatches/doors that go on the central structure along with a pair of ladders that will need to match up with the notches in the upper deck section and shorter ones that lead to the forecastle. The instructions consist of an exploded view of the overall ship along with two detail views. One of these illustrates the building of the smaller guns and the other shows the placement of the windows and ladders. A parts layout is also included. The other side of the instructions offer two small line drawings of the completed model from the side and top as well as a history. There is no color information, which I feel should have been included. From what I have been able to gather, the hull was either white or a very light grey with an orange/tan funnel and intakes. Trim work appears to be black and the waterline area is red. It is a well done kit of a unique subject and while it will take some work to getting it built, primarily due to all the small parts, the end result should be a very nice model. Thanks to me for the review kit.